Home Trainers	Nike Lunar Prestos remake an early 2000s classic. Nike Presto is one of the greatest Nike innovations ever. We loved how this avant-garde technology was made accessible to high street consumers as well as the shoe dude crowd after its debut in 2000 and its place in the early days of NIKEiD (with the exclusive patterning – which is something that they should have done for the Roshe too). This is a shoe that helped bring about the flex emphasis that Nike amplified for the Nike Free system and it’s the logical continuation of the Nike Bermuda, Sock Racer, Flow and Huarache. It also reminds us of Crooked Tongues’ debut too, back when the Alpha Project was making us think we’d have shoes that flew by this point in time. Unfortunately we’re not getting floating shoes — we just get remixes of past triumphs, plus some solid reissues. 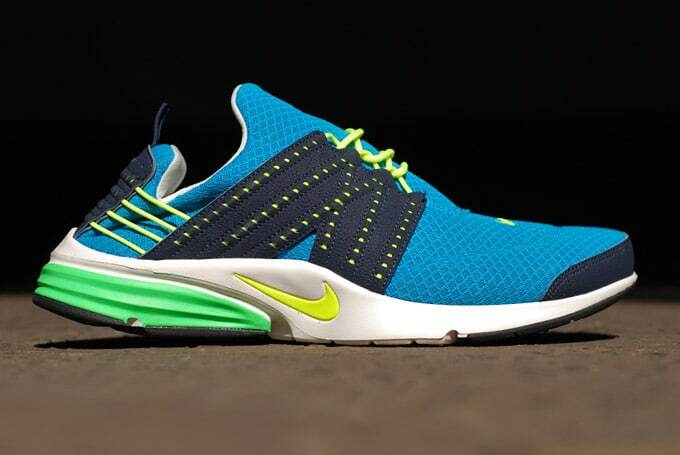 That’s not to say we’re particularly precious about the Nike Presto system, because the Presto Tent, Presto Chanjo, Presto Cage, Presto Roam, Presto Ridge, Presto Faze, Presto Gym and Presto Glide, plus the velour editions of the OG managed to dilute the pure excellence of the 2000/2001 Presto rollout. We like to pretend that it ended after that (bar some nice Foot Locker only editions). The Nike Lunar Presto is the second Lunar Presto (preceded by the kind-of-okay Lunar Presto Rejuven8) in the last three years and it upgrades the old DNA to stay strange. The dynamic mesh is still intact, but the engineered support cage has been replaced by Dynamic Flywire that goes beneath and round the back of the foot to increase the Presto’s patented foot hug. That Flywire application makes the shoe’s rear angle forward sans foot, which gives it an awkward triangular shape. The OG Presto had the Phylon foam on the modsole, but now it gets Lunarlon, while thebottom homages that Duralon outsole. The Nike Lunar Presto is obviously reverential toward the source material, but without the whole XS to XXL sizing concept, we think some of the original appeal is diminished – remake syndrome in effect again. These Neo Turq/Volt versions go on sale in the Crooked Tongues store in a few weeks.